This is Callaway's distance ball made for high handicappers that want to hit the ball a long way. The name Big Bertha has been with Callaway for some time and has been a very successful brand in their irons and woods. Let's take a look at the golf ball. This is a two-piece ball which is very typical in a long distance ball. 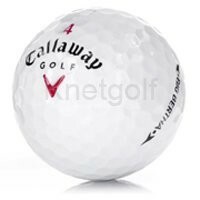 It has a Lonomer cover with a large rubber core, and it has Callaway's signature Hex dimple pattern. I've always liked their Hex dimple design, but that's all that I like about this ball. If you are comparing this ball with the Callaway Big Bertha Blue, the blue is the softer of the two. But don't be fooled -- neither ball is very soft. I wouldn't buy this golf ball. It has a very unappealing hard feel and makes a horrible click when you hit it. I would recommend you check out the Callaway HX Blue. This ball is still very long but has a much better feel.